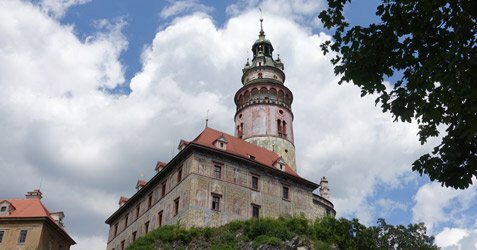 A day trip to Český Krumlov for €15..! 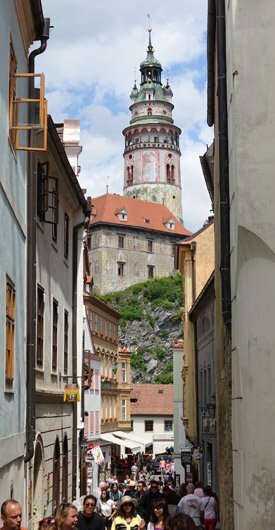 The UNESCO-listed town of Český Krumlov is the second most-visited place in the Czech Republic after Prague, and it's easy to see why. It's picture-postcard perfect. You don't need an expensive tour, nor do you need to endure a bus. You don't even need to book in advance. 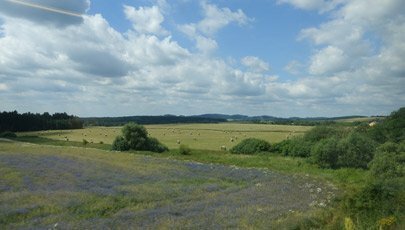 Just buy a round trip train ticket in advance or on the day, it cannot sell out - and hop on a comfortable train through the Bohemian farmland and forests. The train ride is part of the fun, and you might even discover where Budweiser beer comes from on the way! 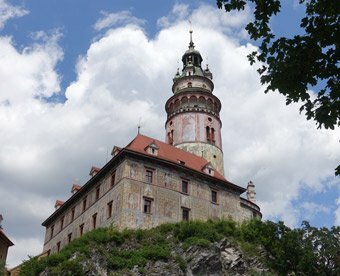 You can go to Český Krumlov and back in a day, or perhaps stay over and make it a 2-day trip. 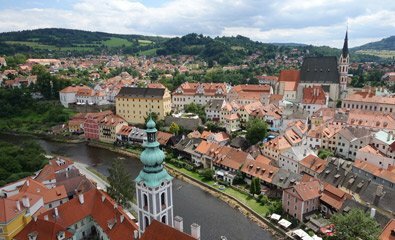 Trains link Prague with Český Krumlov every 2 hours through the day taking 3h30. For example at the time I write this there are morning trains at 05:34, 07:34, 09:34. You make one easy change from mainline train to branch line train at České Budějovice. New direct train! A direct express train now leaves Prague Hlavni at 08:01 & arriving Český Krumlov at 10:55. To check times online, simply use jizdnirady.idnes.cz. The English button is at lower right. Trains leave Český Krumlov station every 2 hours taking 3h30. For example at the time I write this, there are late afternoon or early evening trains at 16:55 or 18:52. You make one easy change from branch line train to mainline train at České Budějovice. New direct train! A direct express train now leaves Český Krumlov at 14:07, arriving Prague Hlavni 16:57. 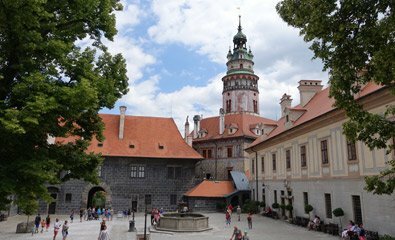 For a day trip, taking the direct train leaving Prague at 08:02 then the 18:52 back would give you over 7.5 hours in Český Krumlov. 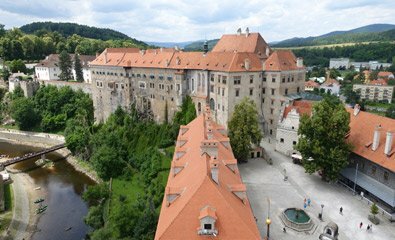 The 09:34 out and 16:55 back would give you over 3.5 hours, enough to wander the streets and castle courtyards, climb the castle tower and have lunch. It's up to you. With trains, you can come back earlier or later if you like as you are not committed to a particular time, you can decide on the day. Český Krumlov station is a fair walk from the old town, see map of Ceský Krumlov. But taxis will be waiting and can take you right to the heart of the old town square in 10 minutes for around 100-150 koruna, about €4-€5 for all passengers. Chances are that there will be other tourists on the train so you can share a taxi and split the cost if you like. Prague to Cesky Krumlov costs around 195 koruna (€7.50) each way with an early bird ticket (Včasná) booked at www.cd.cz or at the station up to a day before travel or 275 koruna (€10.50) one-way with a full-price regular ticket (Obyčejná) bought on the day. 1st class costs less than 50% more. Tickets are good for any CD-operated train that day or the following day, no reservation necessary, just hop on any train you like. (1) Prague to Ceske Budejovice costs around 165 koruna (€6.50) each way with an early bird ticket (Včasná) booked at www.cd.cz or bought at the station up to a day before travel or 265 koruna (€10) one-way with a full-price regular ticket (Obyčejná) bought on the day. 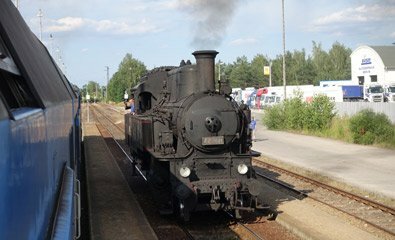 (2) Ceske Budejovice to Cesky Krumlov by GWTR local train costs 40 koruna (€1.60) paid at the station at Ceske Budejovice or from the machines on board the train. Do you need to book in advance? No! Unlike buses or planes, trains cannot sell out. You can always buy a ticket and hop on the next train, sitting in any empty seat So no need to commit. 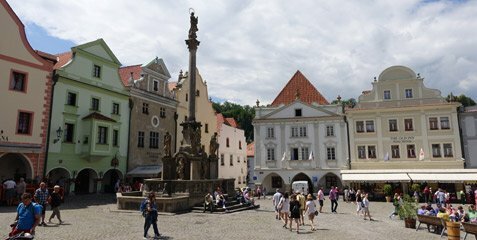 You can decide to spend a day in Český Krumlov on the spur of the moment if you like. Although as you can see from the fares above, the early bird fare saves you a koruna or two if you buy at least a day ahead. 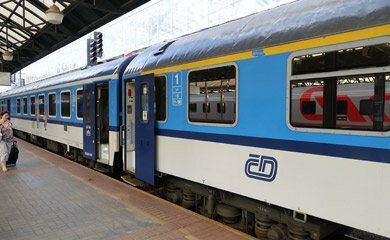 Remember you can check train times at jizdnirady.idnes.cz as this has times for both CD Czech Railways and private operator GWTR. Simply buy a ticket from Prague to Cesky Krumlov or vice versa online at the Czech Railways website www.cd.cz and print your own ticket or just show the barcode on your iPad or smartphone. Easy! For English, change the Czech flag to the UK flag at top right. Only one name & passport number are needed to support a ticket, even if the ticket is for 2 or more people. Your ticket will be valid for any CD train that day from Prague via Ceske Budejovice to Cesky Krumlov, not just the one you book - although as it is not valid for the privately-run GWTR trains you'll need to buy a ticket for a few koruna for the branch line train between Ceske Budejovice & Cesky Krumlov if for whatever reason you choose not to use the direct CD train. You can of course buy tickets at the station on the day at the same price, though you'll pay the slightly higher regular price, no big deal. (1) Buy a ticket from Prague to Ceske Budejovice or vice versa at the station, or buy it online at www.cd.cz and print your own ticket or just show the barcode on your iPad or smartphone. For English, change the Czech flag to the UK flag at top right. This ticket will be valid for any train that day, not just the one you book. Only one name & passport number are needed to support a ticket, even if the ticket is for 2 or more people. 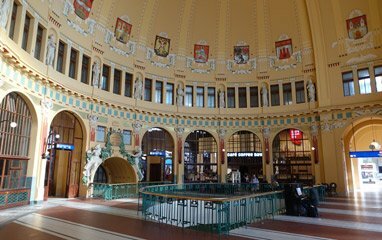 (2) Buy a local ticket for the GWTR train from Ceske Budejovice to Cesky Krumlov either at the station in Ceske Budejovice (there's a distinctive orange & green GWTR ticket window) or on board the GWTR train from one of the self-service ticket machines, these take cash or you can use contactless Visa or MasterCards. Feedback appreciated. 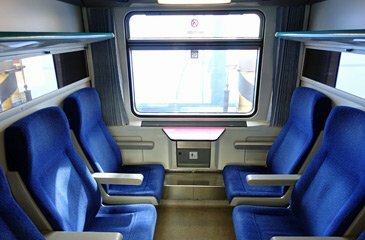 Seat reservations on CD mainline trains are optional for a small extra charge on the mainline train and not possible on the branch line train. 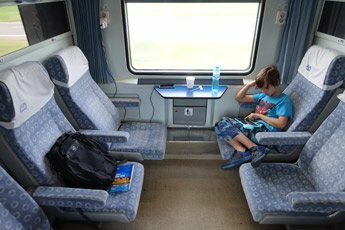 There's usually little point in worrying about reserving a seat, even in summer, although on a Monday morning train out of Prague, or a Friday or Sunday afternoon train back to Prague it might be a good idea. You can add a reservation when making a booking, or make one separately at www.cd.cz by clicking the I want a reservation only link against the train you want in the search results. This is the train from Prague to České Budějovice - the direct Prague-Cesky Krumlov train is similar. Just hop on any time before departure and sit in any empty unreserved seat. 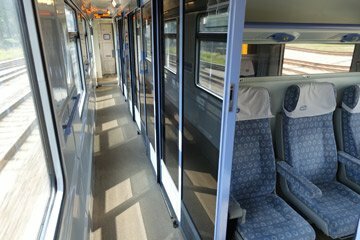 On this particular train there are modern air-conditioned cars going through to Linz in Austria, and older cars only going as far as České Budějovice. Above left, a very swish 1st class compartment car with power sockets in all compartments. We change from mainline train to branch line train at the southern Bohemian city of České Budějovice. 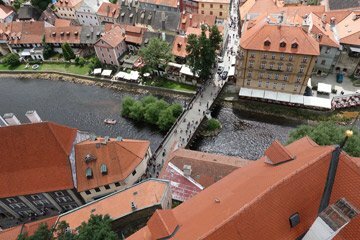 A simple matter of going down the steps, through the subway and back up onto an adjacent platform for the train to Český Krumlov. 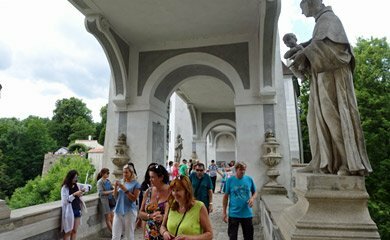 Think you've never heard of České Budějovice? Think again, I bet you have... It's former German name might be more familiar: Budweis. Yes, that's right, home of the original Budweiser beer! Although you can read up on the argument between Czech Budweiser and the American version at https://en.wikipedia.org/wiki/Budweiser. 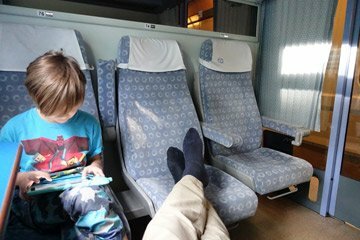 The branch line train to Český Krumlov is 2nd class only, but comes with luggage space, toilet, power sockets and (allegedly) free WiFi. When I took the photos on this page the branch line was run by CD with communist-era double-deck trains. In December 2017 private company GWTR took over the line with smart new regional trains - see the photo above in GWTR's orange & green colours, courtesy of @wanisbunes. Changing trains at Ceske Budejovice simply means stepping off one train, walking through the subway to the next platform over, and stepping onto the GWTR local train. Changing trains only takes 2 or 3 minutes. Arrival at Český Krumlov station. 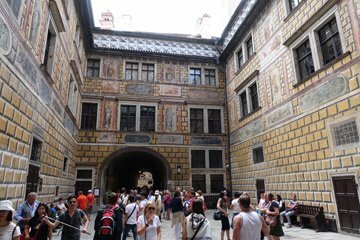 There will be taxis waiting, just hop in one to the old town square - the old town is pedestrianised but the taxis are allowed in. Our Czech taxi driver spoke excellent English, with a Lancashire accent. "Fifteen years living in Preston..." he explained. See map of Český Krumlov showing station. The castle, seen from the top of the tower. When it's time to go, hop in a taxi from the old town square to the station. 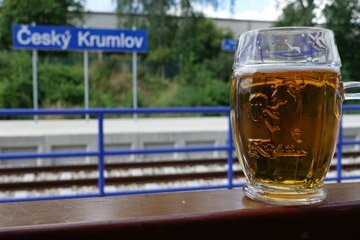 Allow plenty of time for traffic in summer - don't worry if you get there early, a rustic bar at the station serves several types of ice cold Kozel beer. Cheers! Weary? Put your feet up on the way back to Prague... How about some wine from the refreshment trolley? There's no need to bother with 1st class, 2nd class is absolutely fine and the branch line to Český Krumlov only has 2nd class anyway. There isn't a huge difference between classes, see the photos above, what you see is what you get. But then again, as ticket prices are so cheap so why not? 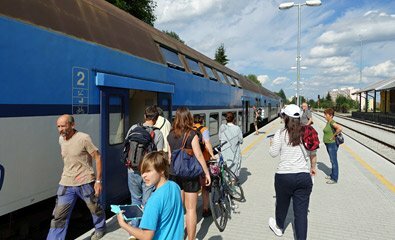 There may be a refreshment trolley for the northern part of the Prague-České Budějovice journey selling beer, small bottles of wine, tea, coffee and snacks. But take your own provisions just in case no trolley turns up on your train. If staying longer in Český Krumlov and taking luggage, this just goes on the racks, it's not a problem. There's usually no WiFi on these trains, but the modern cars on the mainline train have power sockets in both classes and mobile data reception is reasonable for most of the route. 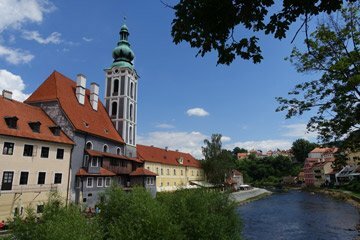 Ceske Budejovice - the former Budweis - is worth a stop on the way if you have time. There are left luggage lockers at the station that will take large luggage, you just need 10 and 20 koruna coins to work them. 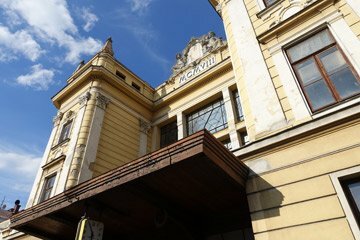 Luggage storage is available at Cesky Krumlov station 07:30-19:30 in summer, 07:30-17:30 winter, ask at the ticket office. You can also store bags for a small fee at the Infocenter in Svornosti Square, see www.ckrumlov.info for opening hours. Map of Prague showing station - Map of Ceský Krumlov showing station. Český Krumlov tourist information: www.ckrumlov.info. 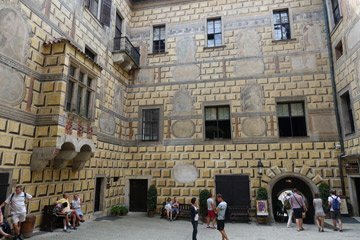 Suggested hotels in Prague old town or near the station. 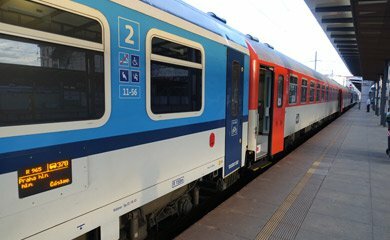 Train times, fares & tickets from Prague to other destinations. 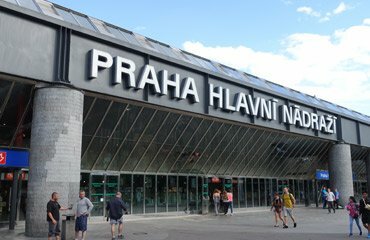 Left luggage lockers in Prague - General advice & tips for European train travel.